If we are to take a global tour of the greatest debt super cycle in history it is only right that we start at the epicenter of the financial universe. The United States 10 year treasury bond is without question the most important bond in the financial world today. The reason? All debts are measured at a relative rate against this bond. This is known as a spread. 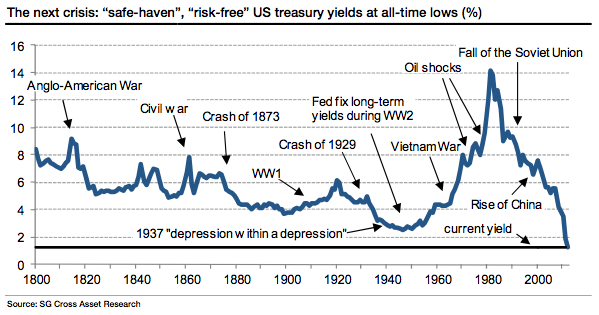 Since the conclusion of world war two US treasury bonds have been considered a risk free bond. This means the market puts the chance that the United States would ever default on its debt at 0%. The market now believes this more than any other time in history, which can be seen in the chart below going back to 1800. 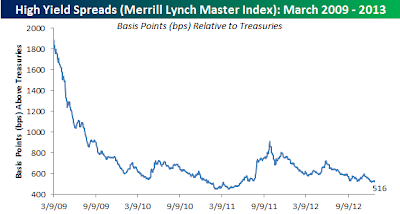 The 10 year treasury bond touched below 1.4% this past summer, a new all time record low going back hundreds of years. This low yield in treasuries has simultaneously collapsed interest rates (raised the price) of other bonds in the market. Investors (think baby boomers ready to retire) have been forced to buy riskier bonds to try and receive a decent return on their money. A perfect example of this can be found in municipal (local government) bonds, which recently touched a 47 year low in interest rates. Junk bonds, those considered the most risky and likely to default, broke below 6% this month for the first time ever. Sales of junk bonds soared 35% globally last year as the global default rate dropped to only 2.7%. 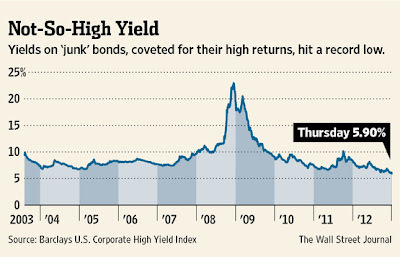 Investors now purchase junk bonds like they used to purchase CD's at the bank. They consider them as good as cash. The chart below shows the collapse not only in the interest rate in high yield (junk) bonds, but the collapse in the "spread" against treasuries. 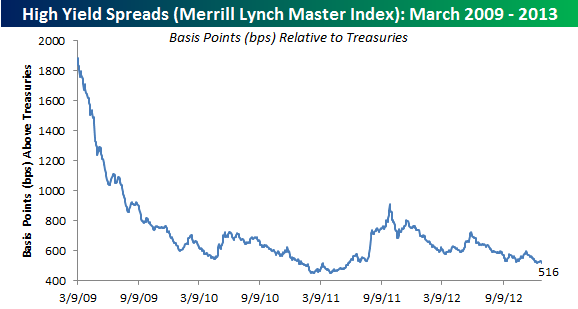 The lower this spread falls the closer investors price junk bonds to "risk free" bonds. Bonds follow secular bull and bear markets just as other assets classes do. The chart below shows the 30 year secular bond bull market from the early 1920's to the early 1950's. 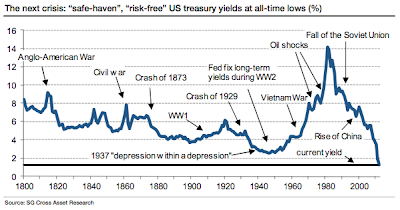 Then the secular bond bear market from the early 1950's to the early 1980's (30 years). Interest rates then peaked and the current secular bull market began in the early 1980's and it has lasted until today (30 years). It is my belief that another secular bear market in bonds is ready to begin. This does not mean rates have to rise back to the high teens seen in the early 1980's. Remember that bonds just moving back to historical normal values would collapse many bond funds. If interest rates begin to rise on US treasuries, the epicenter of the global financial system, it would re-price every risk asset on the planet. It would push up interest rates on mortgage bonds, commercial real estate bonds, municipal bonds, corporate bonds, and junk bonds. 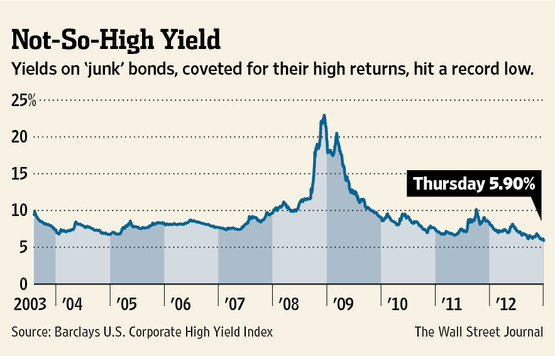 If you could buy a risk free US treasury bond for 6%, would you pay 5.9% for a junk bond? Obviously not (and neither would the market), so the interest rates on junk bonds would soar in order to price the spread against default. Interest rates rising means that the underlying value of the bond is falling as we discussed in earlier sections. This is the most basic and obvious way that investors will get crushed during the coming bear market. However, there are some additional precession waves that will occur due to rising yields beyond the direct losses in the bond market. One of the most important will occur in real estate. Let's discuss how this will impact prices there before moving on to the next rogue wave coming.